I just want to signal that some caution is in order about reading the military and political situation in Libya. Muammar Qaddafi’s counter-attacks are creating the image in the media of the momentum being on his side, but in fact he is bogged down and making little progress, despite the setback Thursday for the rebels at Ra’s Lanuf (itself taken by a small amateur rebel force only last weekend). Qaddafi’s military appears still not to have taken the city of Zawiya after a massive assault, despite government assertions to the contrary, which some Western news sources have unwisely credited Zawiya is only 30 miles west of Tripoli. Although they have pushed back a poorly organized small force at Ras Lanuf, the big cities of the east remain united against them. The rebels still have at least 75% of the country and 80% of the oil wealth, and a lot of small towns would have to fall to alter that calculus. While it is true that Qaddafi has jets and the rebels don’t, jets don’t take territory. And, Qaddafi’s armor has performed poorly in Zawiya, so his advantage in tanks seems hard to operationalize. Aljazeera Arabic is reporting mid-day Friday Libyan time that downtown Zawiya to the west of the capital of Tripoli remains in rebel hands despite aerial bombardment today and despite a fierce tank and artillery attack by pro-Qaddafi military forces during the past four days. Qaddafi had claimed to have reconquered the city on Wednesday and brought Western journalists to a pro-regime rally on the outskirts of the town. Aljazeera’s reporter in the city says that Qaddafi’s men have placed snipers on the walls above the entrances to the city and are using Zawiya residents as human shields, but that the rebels have reasserted themselves in the central square. The western city of Zuara is also said by CNN to be supporting the Benghazi-based opposition, and its tribes are lending support to Zawiya. In the western town of Lanut, crowds came out Friday chanting against Qaddafi and destroyed a stone representation of his “Green Book,” which, in imitation of Mao Ze Dong, had embodied his political philosophy for the masses. In a counter-attack to the east, pro-Qaddafi forces have taken the residential areas of the oil and refining town of Ra’s Lanuf, pushing back the rebels who had taken it last weekend. The rebels have taken up a position 12 miles to the east at Ra’s Lanuf’s industrial and refining center and fierce fighting and bombardments around Ra’s Lanuf are reported Friday morning. The eastern suburb of Ra’s Lanuf, al-Uqaila, was bombarded from the air, and witnesses report plumes of smoke rising from the blast sites. Intensive fighting is reported at the refinery. The regime is clearly desperate to deny the rebels any oil revenue they might realize from Ra’s Lanuf’s facilities, which ordinarily produce 200,000 barrels a day. 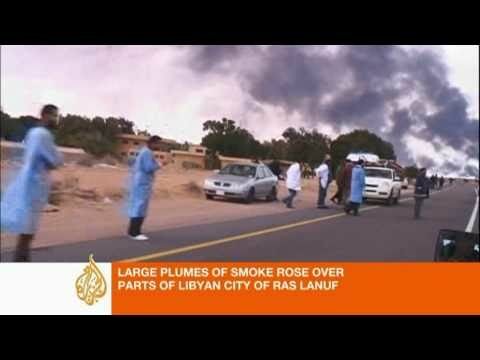 Aljazeera English reports on Qaddafi’s aerial bombardment of an oil storage depot at Ra’s Lanuf. There was also an expeditionary attack from the Qaddafi-held airbase near the large Western city of Misrata (Misurata), but details are sparse. Despite regime warnings against attending Friday prayers in the east, people in Ajdabiya to the southwest of Ra’s Lanuf came out to chant against Qaddafi today. Likewise, Ajdabiya is sending reinforcements to the embattled rebels in eastern Ra’s Lanuf, according to AFP. The rebel force facing Qaddafi in Ra’s Lanuf and points east is small, perhaps only 1500 men, most of them inexperienced. They are led by officers who defected from Qaddafi’s forces. The invading regime forces from Sirt are also small, perhaps about the same size, but they are supported by armor and air power. There are nevertheless rumors of divisions among the Sirt officers themselves.